In the Settings section, click Apply Limits to enable limit checking for the account or user. 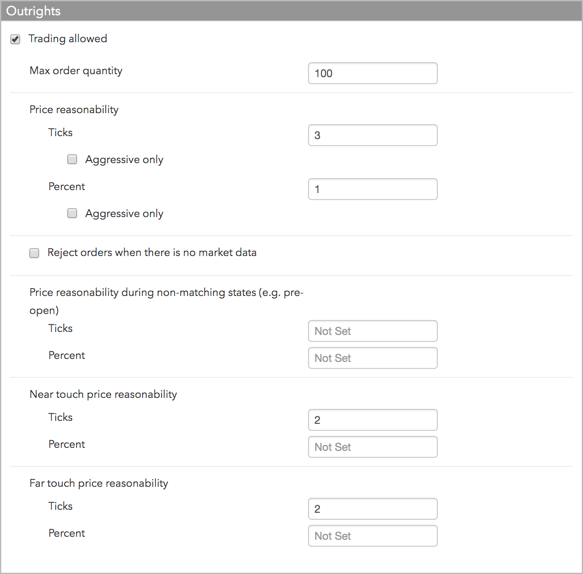 Optionally, you can determine whether to apply the same limits to block/cross trades and/or synthetic parent orders. Note: If Apply Limits is checked, you must define product or contract limits for each product or contract that the user, parent account or child account is allowed to trade. In the Limits section, click +Add to create a new risk limit, or select an existing limit in the Limits section. If you select an existing limit, you can copy product limits within the selected user's or account's limit tab by clicking the Copy button. When creating a new risk limit, select the Exchange, Product Type, Product, and/or Contract in the New Limit window and click Add Limit. Note:If you do not specify a product, then the limit will be the default limit for all products of the selected product type for the selected exchange. If you do not select a contract, the limit will be the default limit for all contracts for the selected product. The product limit settings are displayed. Note: The following section appears if applying risk limits to all contracts or a single contract. Trading Allowed: Specifies whether outrights can be traded for the selected contract. Max order quantity: Specifies a limit on the maximum individual order size that can be entered for the contract. This setting overrides the max order qty setting that might exist at the product or exchange level. Price reasonability: Determines how far from the market price a user may enter an order for the contract. You can set a number of ticks away from the market using the Ticks field, and set a percentage away from the current price using the Percent field. If you only want to enforce this setting for buy orders above the limit and sell orders below the market, check the Aggressive only option. This setting overrides the price reasonability setting that might exist at the product or exchange level. For more details refer to Pre-Trade Price Controls. 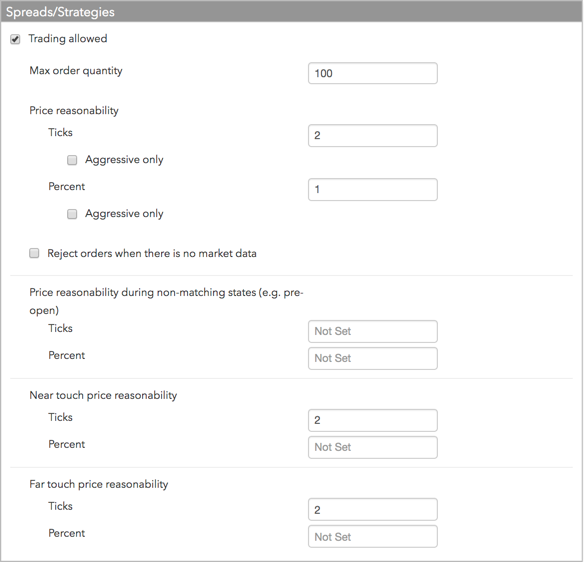 Reject orders when there is no market data: To reject orders when there is no market data regardless of whether or not the market is in a matching or non-matching state, check this option. By default, orders are allowed when there is no market data. Price reasonability (ticks) during non-matching states (e.g., pre-open): Check this setting to apply price reasonability during non-matching exchange states. When applied, the price check uses the indicative open price as the market price, otherwise, the price check uses the first available price from the last/close or settle, in that order. If none of these prices exist, then the algorithm assumes there is no market data at all, and allows or rejects the order based on the Reject orders when there is no market data option. You can set a number of ticks away from the market using the Ticks field, and set a percentage away from the current price using the Percent field. Note: The following section appears if applying risk limits to all products or all contracts for a single product. 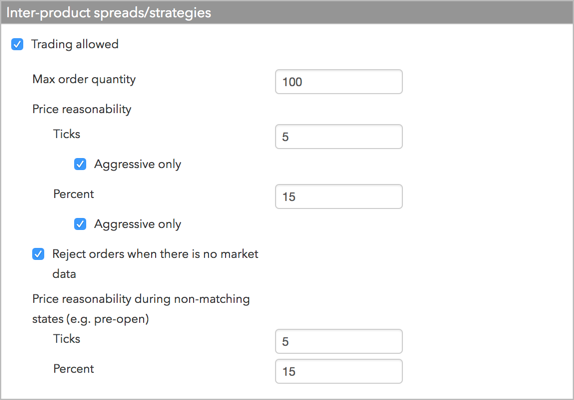 Trading Allowed: Specifies whether spreads and strategies for the product can be traded. If you plan to restrict trading in this product but allow trading for specific contracts for this product, leave this option unchecked. Max order quantity: Specifies a limit on the maximum individual order size that can be entered for the spread/strategy for a particular product, product type, or contract. Price reasonability: Determines how far from the market price a user may enter an order for the contract. You can set a number of ticks away from the market using the Ticks field, and set a percentage away from the current price using the Percent field. If you only want to enforce this setting for buy orders above the limit and sell orders below the market, check the Aggressive only option. For more details refer to Pre-Trade Price Controls. To remove a user's limit, select the limit in the Limits section and click Remove.